Gardeners want to conserve water while still maintaining a healthy landscape. Using a sprinkler or watering with a garden sprayer doesn't allow water to percolate directly into the ground. Soaker hoses water gardens at the surface of the soil through a method called trickle irrigation, apart from saving water, this technique also helps avoid mildew problems on plants. Low water pressure keeps the hose filled with fluid that escapes through thousands of tiny holes along the length of the hose. Soaker hoses water efficiently and promote reasonable use of water for landscape maintenance. Plastic or vinyl soaker hoses offer the homeowner an affordable option for a hose. The lowest quality and priced hoses are composed of plastic or vinyl. This type of soaker hose features hundreds of little holes perforating the length of the hose. Hoses comes in standard sizes from 25 to 100 feet and various diameters ranging from 1/2 inch to 3/4 widths. Plastic or vinyl doesn't tolerate exposure to heat or cold well so these varieties of soaker hoses tend to split easily when placed under a mulch bed. Porous rubber material creates a sturdy, long-lasting soaker hose that can tolerate being buried under mulch in the garden. These hoses are made of fibrous rubber bonded together to form a tough material for use during irrigation. Fibrous soaker hoses feature the trademark thousands of holes placed throughout the hose to allow slow dripping of water into the soil. These hoses tend to be considerably more expensive than plastic or vinyl, but last much longer. 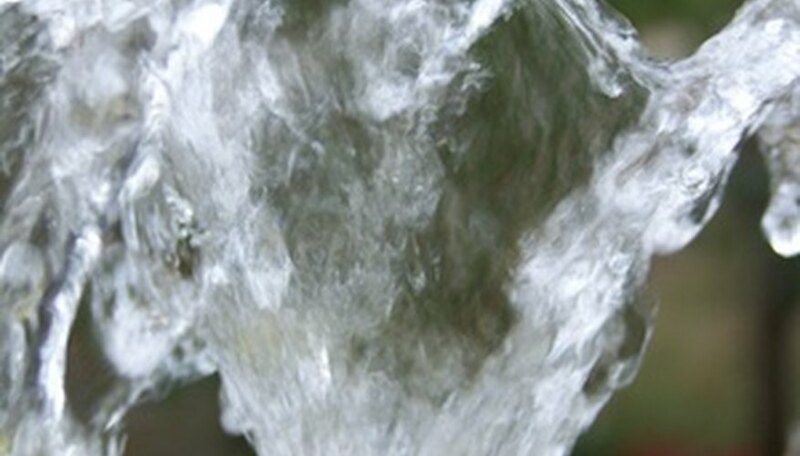 Purchase a pressure valve to attach to the outdoor water spigot to help control water flow. This type of soaker hoses offers the best of both worlds in garden irrigation. Wind a soak-and-spray hose between the plants, turn it on. The hose both trickles water slowly into the ground and sprays water upward onto nearby plants. The spray height adjusts by controlling the water pressure through the hose. A sprinkler hose features a line of perforations on a top of an oval shaped hose. The top of this hose is compressed to allow it to lie flat on a garden surface. Turn on the water flower and the hose emits a low-level sprinkle of water to the base of plants. Water pressure controls the height of the spray. This hose also transforms into a soaker hose when it's flipped over to place the holes against the soil surface.